Aunt Sissy, even in her 70's and 80's, was always ready to go camping (albeit luxury camping) with friends and family. Everyone, but especially her grandchildren, loved the special treats Nana brought to the campground or to the cabin. 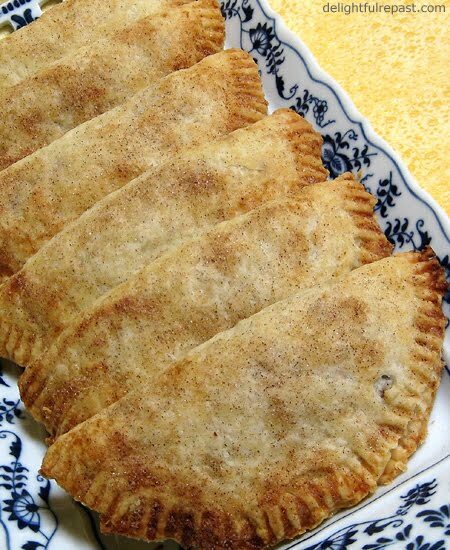 One of those family favorites was her apricot hand pies. Sweet, tangy filling in a tender, golden crust. No plates and forks required, they're perfect for snacking on the go. I've been making pies since I was a teenager, and I always made my crust by hand. Much as I loved my Cuisinart (I've had it since 1980), I never used it for pie crust. Until recently. I find myself more and more inclined to take advantage of the "mod cons." Come to find out, I think my all-butter crust actually turns out better in the Cuisinart. Just don't over-process, especially after the liquid is added. 1 Cut dried apricots into 1/4-inch strips (the short way, if the apricots aren't round). In 1.5-quart saucepan, combine apricots and water. Bring to boil. Cover, reduce heat, and simmer for 15 minutes. Stir in sugar, and return to boil. Cover, reduce heat, and simmer until most of the water has been absorbed and mixture is very thick, about 15 minutes. It will thicken more as it cools. Cover and refrigerate at least 2 hours, or up to 24 hours, before assembling pies. 2 While apricot filling is cooling, make pastry and chill two round disks of dough for 30 to 60 minutes. When ready to assemble, preheat oven to 400 degrees. Working with one at a time, cut each disk of dough into 6 wedges. Keep them in the freezer while you work with one piece at a time; butter pastry must be kept cold. Round the wedge of dough and, on a lightly floured surface with a lightly floured rolling pin, roll into a 5- to 6-inch circle. Using a saucer of that size as a guide (I use a 5.5-inch saucer), trim any strangely shaped edges. 3 Place 2 level tablespoons (I use a metal 1/8-cup measure) of apricot filling on one side of the circle. (You may portion out all the filling on a plate first--it's that thick--to ensure you don't end up with too much or too little for the last one.) Fold in half, pressing edges to seal (I like to finish with a fork). 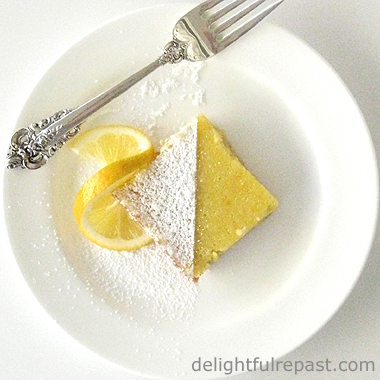 Place on a lightly greased or parchment-lined baking sheet. Repeat for total of 12 pies. In small bowl, mix sugar and cinnamon. Sprinkle pies with cinnamon-sugar. Bake at 400 degrees until golden, about 20 to 25 minutes. I definitely need to try this, albeit with a gluten-free crust. I LOVE apricots and those look delish! I'll eventually post gluten-free crust and other gluten-free things. I go GF from time to time, either for myself or some of my friends. Nana would be so pleased! What a lovely tribute to her and to her memory. Thank you, Pam. I hope Kimberly & Jason and Brad & Jennifer (and Kevin and Jana) will make Nana's recipes for Logan and Sophie (and Hunter, Mallory, Morgan, Madison and Mikaela) and others to come. Foods make the best family traditions! I adore apricot desserts, and this looks like it is very do-able - AND DELICIOUS. Great job, keep up the yummy blogging! Thanks, Patti! I'll keep it up as long as I can still fit into my clothes! Mmmmmm! This sounds delightful! Can't wait to try this recipe! Thank you so much for sharing! Sounds delish! Can't wait to try these. Thanks, Julia. I can't wait to make another batch! Thank you, Anne! I seem to be focused on desserts lately! Hi Jean, Peter at Phi One pointed me to your blog, and it's beautiful! Thank you for this recipe - for the pastry especially, as I've been looking for a pastry to use for sweet turnovers, and the ones I have are way too soft. Your aunt's recipe looks like spot on! Thanks, Celia! These little pies are so good. And I use the same pastry for my pasties as well. I was looking at your blog about those delicious hand pies. Cherries and apricots are in season now in new Mexico and this recipe looks perfect for all the extra fruit! My boyfriend is getting back from a too long trip in two weeks and boy does he LOVE pie. I had a question, if I prepare these now, assemble them and all, could I freeze them raw and pull them out on the day and bake them up? What a treat that would be! Thanks so much and your recipes are beautiful! Thanks, Cav! They should freeze quite well, perhaps taking a few extra minutes to bake. You would bake them frozen rather than thawing them out first. Thank you so much for the recipe. My mother used to make these and I did not get her to write it down before she died. It's perfect! Jacquie, thanks, you just made my day! I'm all about that mother - daughter cooking thing! My BF hadn't had apricot pies in over 30 yrs. When I surprised him with a full batch of the pies, he literally burst into tears! Thank you so much; you recipe made a 62 yo man a kid again! Esther, thank you so much for taking the time to comment. That is so touching! I'm so glad the pies struck a chord with your BF. Jean - these look amazing! Such wonderful on a cold day with tea! Thanks for sharing such deliciousness! Thanks, Bernideen! This is a recipe I "fleshed out" for Aunt Sissy's daughter who had her mom's recipe card that just listed ingredients. These are the perfect escape from the typical "winter foods." Everyone will enjoy a fruit pie or turnover now. I need to get a food processor. My large Magic Bullet can't do everything like a food processor. Nora, thank you. That's exactly what I think - dried fruit available anytime, giving me apricots in winter. I recommend the Cuisinart Prep 11 food processor.